This is an assured debut from a strong new voice in crime writing. Dean, who escaped London city life for forested rural Sweden in recent years, has written an atmospheric, absorbing tale that is more akin to Nordic Noir than British crime in many ways - beyond its geographic location - while blending elements of both traditions. We first meet deaf journalist Tuva Moodyson driving on a forest road in rural Sweden, trying to evade a rampaging elk. She's saved by the sound of a gunshot off in the woods (she has hearing aids, which aren't always reliable, so can often 'hear' to some extent), and when she later learns of a body discovered nearby, she wonders if she might have actually been a witness, of sorts, to the killing. When it turns out the death is not a hunting accident, but the man has been murdered and mutilated in a manner reminiscent of killings from two decades earlier, Tuva sniffs a make-your-career story. But if there really is a serial killer out there in the countryside around Garvrik, back in action after years away, is digging into the case for the sake a byline the smartest idea? Tuva had returned from a burgeoning career in London, marooned to a life writing features for a small-town newspaper in rural Sweden so that she can be closer to her ailing mother. She's overcome a lot, her ambition smolders. DARK PINES has an atmospheric sense of place, populated with a host of unusual and kooky characters befitting small-town rural life. There's a nice sense of isolation, of lurking menace, as well as a lovely tone to the tale, brooding and thoughtful. But the real heart of DARK PINES is Tuva. She's a fascinating character, and Dean does well to bring her 'disability' to the fore in an authentic way, without turning her into a caricature or token 'lets-be-more-inclusive' protagonist. Tuva's deafness is an intrinsic part of her character but not all she is. I thought Dean struck a nice balance with Tuva, similarly to what Australian author Emma Viskic has done with Caleb Zelic in her series. In each case the hero's deafness is more than a character quirk, and has positive and negative effects. The mystery itself is solidly constructed, with suspects, clues, and red herrings. 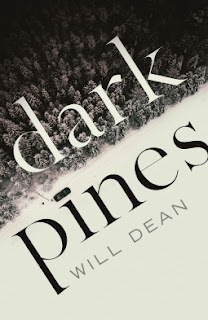 Overall, DARK PINES is a good read seasoned by quality writing, atmospheric setting, and a great main character. The result is something that just has that little bit of extra magic to it. I look forward to the next one.